Charger’s head coach, Mike McCoy, was both concerned and intrigued after learning his 2nd draft pick, Manti Te’o, has an invisible friend. On the first day of Chargers training, McCoy found Te’o kneeling alone by his locker. 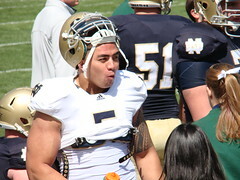 With his head bowed and hands clasped, Te’o was engaged in a passionate conversation with his invisible friend. Te’o fans have reportedly started making posters and shirts designed with “+” symbols to show support for Manti’s invisible friend, God—soon to be the 12th Charger playing on the field. This entry was posted in News, Sports and tagged funny, God, humor, invisible friend, Manti Te'o, Mike McCoy, news, NFL, San Diego Chargers, Sports on May 7, 2013 by The New Porker.